The objective of the study is to determine the characteristic of moisture sorption isotherm from "gaplek" flour fortified with protein from red bead tree flour using various modeling and being observed from the monolayer moisture content and its absorption types. This research used 5 salt solutions and storage temperature of 298K, 308K, and 318K. The models used were Brunauer-Emmet-Teller (BET), Guggenheim-Anderson-de Boer (GAB) and Caurie model. The monolayer moisture content was around 5.07 – 8.53% db. kb value of GAB model was around 0.5941-0.6252. c value of GAB model was around 16.0588-23.4111. C value of BET was around 32.7241-306.5000. Whereas the c value in Caurie model was around 1.1419-1.2769. The equilibrium and monolayer moisture content on ‘gaplek" flour fortified with protein from red bead tree flour was decreasing as the temperature going up. GAB constant value indicated that the process of moisture absorption on the "gaplek" flour fortified with protein from red bead tree flour categorized in type II. Adawiyah, D. R., & Soekarto, S. T. (2010). Modelling of moisture sorption isotherm in food model. Jurnal Teknologi dan Industri Pangan, 21(1), 33–39. Alfiah, M. N., Hartini, S., & Cahyanti, M. N. (2017). Mathematical models and thermodynamic properties of moisture sorption isotherms of fermented cassava flour by red yeast rice. Alchemy, 13(1), 29–40, doi: 10.20961/alchemy.v13i1.4326. Basu, S., Shivhare, U. S., & Mujumdar, A. S. (2006). Model for sorption isotherm for food: A review. Drying Technology, 24(8), 917–930, doi: 10.1080/07373930600775979. Blahovec, J. (2004). Sorption isotherms in materials of biological origin mathematical and physical approach. Journal of Food Engineering, 65(4), 489–495, doi: 10.1016/j.jfoodeng.2004.02.012. Budijanto, S., Sitanggang, A. B., & Kartika, Y. D. (2010). Shelf life study of tortilla using accelerated shelf life testing (ASLT) method and its mathematical modeling of moisture. Jurnal Teknologi dan Industri Pangan, 21(2), 165–170. Chowdhury, M. M. I, Huda, M. D, Hosain, M. A., & Hassan, M. S. (2006). Moisture sorption isotherms for mungbean (Vigna radiata L). Journal of Food Engineering, 74(4), 462–467, doi: 10.1016/j.jfoodeng.2005.03.036. Koua, B. K, Koffi, P. M, Gbaha, P, & Toure, S. (2014). Thermodynamic analysis of sorption isotherms of cassava (Manihot esculenta). 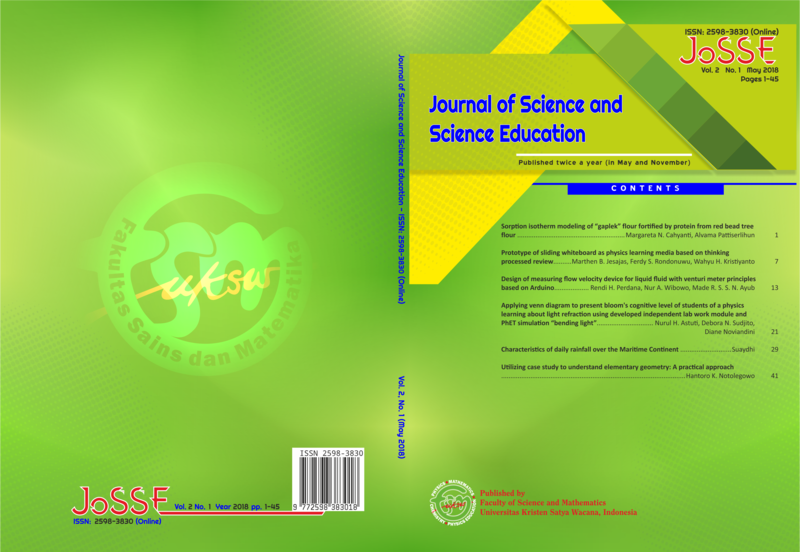 Journal of Food Science and Technology, 51(9), 1711–1723, doi: https://doi.org/10.1007/s13197-012-0687-y. Lomauro, C. J., Bakshi, A. S., & Labuza, T. P. (1985). Evaluation of food moisture sorption isotherm equations. Part I: Fruit, vegetable and meat products. Lebensmittel-Wissenschaft und Technologie, 18(2), 111–117. Maidawati, N. (2011). The utilization of red bead tree (Adenanthera Pavonina Linn.) flour on the optimization of dried cassava flour enriched of protein as ingredient to substitution In wheat flour (Unpublished undergraduate thesis). Universitas Kristen Satya Wacana. Rakshit, M., Moktan, B., Hossain, S. A., & Sarkar, P.K. (2014). Moisture sorption characteristics of wadi, a legume-based traditional condiment. Journal of Food Science and Technology, 51(2), 301–307, doi: https://doi.org/10.1007/s13197-011-0491-0. Sanni L. O., Atere, C., Kuye, A. (1997). Moisture sorption isotherms of fufu and tapioca at different temperatures. Journal of Food Engineering 34(2), 203–212, doi: 10.1016/S0260-8774(97)00072-1. Suprapti, L. (2005). Tepung Tapioka Pembuatan dan Pemanfaatannya. Yogyakarta: Kanisius.